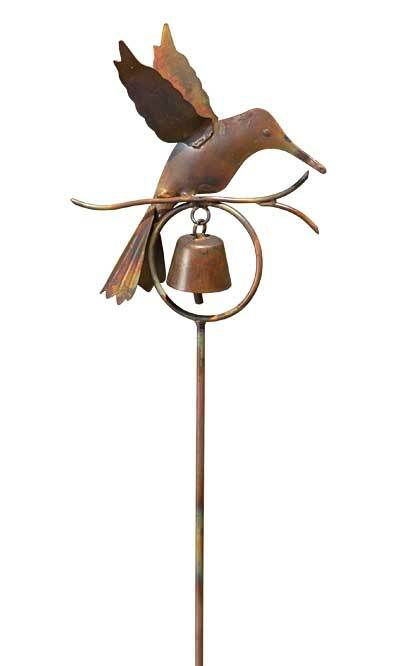 Enhance your landscaping with a soft sound and avian style using this Ancient Graffiti Flamed Copper Colored Hummingbird with Bell Garden Stake. The familiar hummingbird shape, small bell, and flamed copper colored finish combine here to make a fantastic ornament, perfect for showcasing these "flying jewels". A twig shape at the top of the metal stake and ring forms a resting spot for the bird figure, furthering the natural motif. Raised wings, a fanned tail, and generous beak create a recognizable hummingbird shape, and a small bell within the metal circle sits beneath this for a classic combination. A 27" long, metal stake supports this topper, and its 4.5" long, step-in base makes placing it in soil simple. The varied brown colors mesh with the outdoors, and the metal construction offers hardiness. Celebrate a hummingbird in your yard all year with this Flamed Copper Colored Hummingbird with Bell Garden Stake.